Many thanks to Metro Elevator Co., Inc. and The McDonnel Group for their amazing donation of $11,945.00 and their efforts to support our mission! Metro Elevator Inc. Partners with The McDonnel Group to Raise over $11,000 for its First “Ride the Pink Elevator” Campaign New Orleans, Louisiana. The campaign has raised over $117,000 for Susan G. Komen nationally. New Orleans, LA (November 2, 2016) — – Metro Elevator Co. Inc. announced today the completion of their 1st “Ride the Pink Elevator” campaign in Louisiana. The installation is located on The Jung Hotel project, in the heart of downtown New Orleans on Canal St. and launched in May. Through the generous donations of the job site crews, companies and community the campaign raised $11,945 for Komen New Orleans and Susan G. Komen®. Donors include The McDonnel Group, All Star Electric Group and ADS Systems among others. The check presentation will be on Wednesday, Nov. 2, 2016 at 4:00 pm at The Jung Hotel project in front of the pink elevator. Campaign leaders, McDonnel staff, Komen representatives and donors will be in attendance. Metro Elevator hosted a campaign kickoff at the site location in May and donations were accepted through October 2016, which purposefully coincides with National Breast Cancer Awareness month. McDonnel, the construction management firm on this project, installed Metro Elevator’s bright pink construction elevators and pink-ribbon counter-weight on The Jung Hotel. The firm expects the elevators to remain in place through February 2017. McDonnel’s corporate citizenship goes beyond traditional client service initiatives and one-time fundraising activities – it’s woven into the fabric of our business and is engrained in our culture. We have made it a priority to seek out opportunities to volunteer, donate, and support our community. It is through that basic philosophy that we chose to participate in Metro Elevator’s “Ride the Pink Elevator” fundraising campaign for the Susan G. Komen Foundation New Orleans Affiliate. Breast cancer has touched many of our employees’ lives, as well as our extended families throughout the community. The Jung Hotel Redevelopment is a high profile project that provides the “Ride the Pink Elevator” campaign with an opportunity to deliver maximum exposure for breast cancer research and awareness. Allan McDonnel, President of The McDonnel Group, stated “We are pleased to support this effort as it represents the quality of our employees, their extended families, and our community”. Metro Elevator specializes in rack and pinion construction hoist sales and leasing, and paints select elevators the signature Komen pink to raise awareness of breast cancer. They partner with clients, top builders, construction managers and general contractors on select projects in major cities throughout the U.S. and are pleased to work with Komen New Orleans on the model that is being deployed nationally. 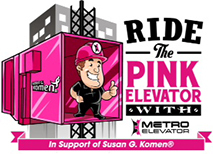 According to Charlie Ernstes II, president of Metro Elevator, interest in the ‘Ride the Pink Elevator’ campaign continues to grow. “I am thankful, excited and amazed that this campaign has taken off at the level it has,” Ernstes said. “It has been an invigorating awakening, beginning with thoughts of doing a one-time fund raiser in Indianapolis to now getting calls from all over the United States asking for our pink elevators. Metro Elevator and The McDonnel Group are proud to be partnering on a project that will have such an impact on the lives of men and women in New Orleans. For more information and to support Metro Elevator’s “Ride the Pink Elevator” campaign to benefit Komen, visit Komen.org/PinkElevator. Metro Elevator Co. Inc. was founded in 1970 and is based in Indianapolis, Indiana. We specialize in sales, service and leasing of various brands of rack and pinion construction hoists. Our corporate motto is, “Getting our customers to the top since 1970.” Metro Elevator also is a proud sponsor of the Indianapolis Colts and Indy Car driver Pippa Mann, in the Komen Indy car at the 2014 Indianapolis 500. Visit metroelevator.com or call 317-562-9833. Connect with us on Facebook at facebook.com/metroelevator and Twitter @metroelevator and to make a donation visit www.komen.org/pinkelevator or mail checks made out to Susan G Komen, to Metro Elevator, Attn: Rachelle Brown-Brummett, 3110 N Ritter Ave., Indianapolis, IN 46218. The McDonnel Group is an award winning Louisiana-based general contractor that provides comprehensive services that go beyond the mere construction of new projects. The ability to understand not only the construction process but also the overall design, development, and usability of each project distinguishes us from our competitors. Our staff and ownership possess a unique combination of talents that are unparalleled. With an average of 25+ years of experience amongst each of our key staff members, McDonnel has a broad knowledge base of the construction requirements that are critical for success. McDonnel’s objective is to deliver outstanding results by utilizing innovative solutions that provide optimum results. Whenever there is a more professional way to ensure value, clients can rely upon McDonnel to propose such a course. From pre-construction services and project engineering to construction management and field logistics, McDonnel has the unique advantage of being able to manage each project from inception to end. Our extensive hands-on experience, combined with our dedication to precision workmanship, gives clients the assurance that we understand the sophisticated demands of each and every detail of their project. A complete historic restoration will preserve this 108-year-old downtown New Orleans landmark building. The 550,000 SF 17-story building, located on the iconic Canal Street, will be rehabilitated and repurposed to include multi-family apartments, hotel rooms, retail, and commercial spaces. In addition, the plans call for restaurants, meeting space, fitness center, and spa. A new 7-story parking garage has been constructed. The project also calls for replacing the entire mechanical, electrical, and plumbing systems. The developers are seeking to utilize Federal & State Historic District Tax Credits. Susan G. Komen is the world’s largest breast cancer organization, funding more breast cancer research than any other nonprofit while providing real-time help to those facing the disease. Since its founding in 1982, Komen has funded more than $847 million in research and provided $1.8 billion in funding to screening, education, treatment and psychosocial support programs serving millions of people in more than 30 countries worldwide. Komen was founded by Nancy G. Brinker, who promised her sister, Susan G. Komen, that she would end the disease that claimed Suzy’s life. Visit komen.org or call 1-877 GO KOMEN. Connect with us on Facebook at facebook.com/susangkomen and Twitter @SusanGKomen.